DragonWave has announced that it will be acquired by Transform-X, a US-based privately held company possessing advanced waveform, software and hardware technologies to drive future evolutions in high-capacity microwave radio, satellite radio, broadcast and other RF communications. The new company will operate under the name of DragonWave-X and will expand its portfolio in the future with new radio solutions that integrate disruptive waveform, antenna and hardware technologies. 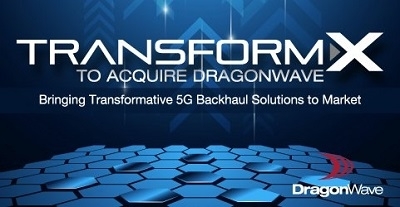 The transaction is highly synergistic and will provide exciting opportunities for DragonWave to integrate innovative new capability into current and future products in order to address critical 5G backhaul challenges.